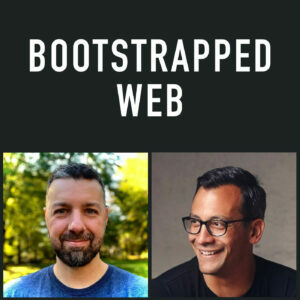 Bootstrapped Web is now a 2-host podcast! Welcome Jordan Gal, as the new co-host of the show. Jordan joined me on two previous episodes (31 and 21) and we hit off so well that I thought, hey, why not make it permanent? A lot will remain the same: The show will continue to be focused around bootstrapping a business online, learning through case studies and lessons learned by doing. But we’ll also focus more on the takeaways and stories from what’s going on in our businesses day-to-day, week-to-week, and hopefully extract some actionable lessons you can use in your work. How setting an internal and external “date” to launch, helps you actually get there. How to use your competitive nature to push yourself further. How to use your creative nature to do great work, while shipping on time. How to be strategic about what to work on and launch in the next 12 to 18 months. Previous Previous post:  Launch Your Product Business… By Getting a Job? Next Next post:  Why Do an Info Product?